Oregon Wine Is Killing It! It seemed only natural to kick off this May issue with a tasting of Oregon wines since May is Oregon Wine Month. The Oregonians have plenty to celebrate, as the wine business is killing it, leading the nation in wine sales in 2014. According to the 2015 Wine Sales Report by Ship Compliant, Oregon had the fastest growth in direct to consumer (DtC) sales to customers in 2014, over double the next leading region. 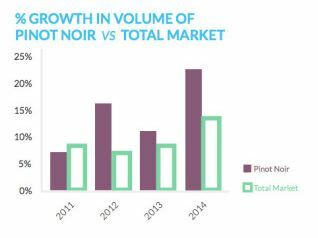 The figures reflect an increasing demand for Pinot Noir, and Oregon Pinot Noir in particular, across the country. The volume of DtC shipments of cases of Oregon wine increased 46% in 2014, compared to regions in California and the rest of the U.S. that were below 16% increases in volume. DtC shipments from Oregon wineries increased 53% in value. The average cost of a bottle of Oregon wine was $39.72, a 4.2% increase over 2013. Since most Oregon wineries are small (5,000 cases or less production annually), they lack distribution and must concentrate on DtC sales through wine clubs and other marketing ventures. Full Glass Research study found that the Oregon wine industry had an economic impact of $3.3 billion in 2013. Planted acreage increased by 18 percent since 2011, the number of wineries increased by 45 percent and there was a 39 percent increase in sales. Part of the success has been a focus on the higher-quality, higherpriced segment of the wine market. Oregon growers have the highest average price per ton of grapes, and Oregon wineries have the highest average revenues per case. The strong growth of the Oregon wine industry has attracted new investment from the U.S. (California’s Jackson Family Wines, Foley Family Wines, and Wagner Family of Wines, and Washington’s Ste. Michelle Wine Estates and Precept Wines), and global interests such as Louis Jadot. Oregon now has more than 24,000 acres among 951 vineyards and several hundred acres currently awaiting development. 72 varieties of grapes are grown. The state is the third largest wine producer at 3.5 million cases in 2014 according to Wines Vines Analytics, behind California and Washington if only wine from vinifera grapes are considered. Oregon Wines Fly Free program has been so successful that it has been extended through 2017. Visitors traveling from Oregon on Alaska Airlines who are members of Alaska Airlines Mileage Plan can check a case of Oregon wine for free. The Oregon Wine Board, Travel Oregon and Alaska Airlines collaborated to make Oregon the first state to launch a statewide wines fly free program in September 2013. Today, more than 300 Oregon wineries participate, and almost 5,000 cases of Oregon wines have been checked for free since the program started. As a bonus, inbound visitors can receive complimentary tastings at any participating winery by showing their Alaska Airlines boarding passes within a week of arrival. A live art mural by a graffiti artist depicting the magic of winemaking will be created in front of Chapter 24 Vineyards new tasting room in Dundee, Oregon during Oregon Wine Month. Ashley Montague, who paints Eardrums for Eyelids, is a renowned Portland street artist who has created awe-inspiring murals throughout the city and beyond. Chapter 24 Vineyards has commissioned a mural, “INFUSION: Chaos, Change and Emergence” in front of their tasting room. This is the first known time that urban street art has taken place in the Willamette Valley. Internationally renowned artist Cathy Bleck will draw an internal mural in the tasting room. Visitors to the tasting room can witness the spectacle of live mural art created before their eyes on May 16-17 and May 23-24 from 11:00 to 5:00 each day, along with a tasting flight of Chapter 24 Pinot Noir. The winery’s website is www.chapter24vineyrds.com. Oregon Wine Month, a statewide promotion launched by the Oregon Wine Board, was first proclaimed by former governor John Kitzhaber, and is now in its fourth year. A new website, www.oregonwine.org, details the month-long promotions. Follow #oregonwinemonth. 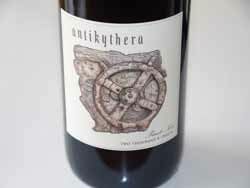 Most Antica Terra wines are blends but the Antikythera is from a single estate vineyard located in the northernmost part of the Eola-Amity Hills. The current owners have been farming this vineyard for almost a decade. There were not immediate rewards in the early years but persistence paid off. Winemaker Maggie Harrison says, “The 2012 Antikythera is the wine I’ve been hoping to make since the day I first saw the vineyard.” The 2012 vintage gave qualities that are only seen once every twenty years or so. Private, seated tastings are available at the winery from Wednesday through Sunday, November through August by appointment. Visit www.anticaterra.com. This winery is a remarkable success story. Brian Marcy and Clare Carver left Napa for Oregon 9 years ago to find some backyard space and make some wine. They used all their resources to buy the property that is now Big Table Farm, so they began modestly with just 150 cases. Slowly they revived the 1890 farmhouse that was painted pink inside and out, added a barn to house their horses, and built a winery that was completed in time to make the 2014 vintage wines. Today, production is 3000+ cases of wine that receives many critical accolades. Visit www.bigtablefarm.com. 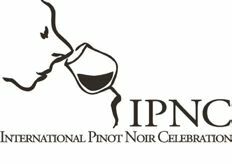 Big Table Farm is one of the featured wineries at this year’s International Pinot Noir Celebration, July 24-26. The 2013 vintage was characterized by a modestly warm summer followed by a very cool and rainy September. The result was that grapes reached maturity with very low sugar and the resultant wines have under 12 percent alcohol in some cases. 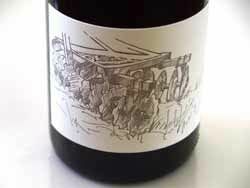 A new value-priced Oregon Pinot Noir label from Joe Wagner’s (of Caymus Wagner Family) Copper Cane Wines & Provisions, which includes the Meiomi label. Copper Cane Wines & Provisions was founded in 2014 by Joe and Amber Wagner. 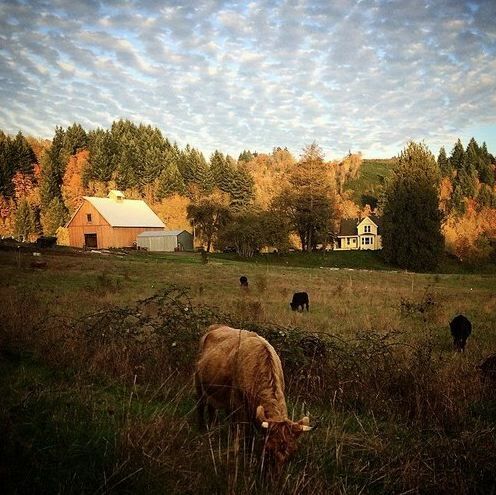 Grapes are sourced from the Valleys of Willamette, Umpqua and Rogue. Large production, widely distributed. The website is www.coppercane.com. Since its founding in 2005, this winery has undergone a number of changes. In 2014, winemaker Sashi Moorman, sommelier Rajat Parr and Charles Banks of Terroir Selections became minority partners in Evening Land Vineyards and took over operations. 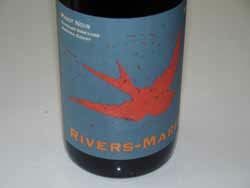 Winemaker Ian Burch replaced founding winemaker Isabelle Meunier at the winery in Salem, Oregon. Dominque Lafon continues to play a consulting role. 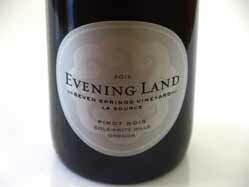 Mark Tarlov, the founder of Evening Land Vineyards, signed a 45-year lease in 2007 of the 100-acre Seven Springs Vineyard and Evening Land Vineyards is the exclusive producer of wine from this vineyard. A new label, Seven Springs Vineyard will appear with the 2014 vintage. The website is www.elvwines.com. J. Wrigley Vineyard is owned and farmed by the Wrigley family who planted their vineyard in 2008. Pinot Noir clones are Pommard, 115 and 777, primarily rooted in volcanic soil. 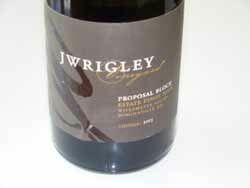 The J. Wrigley label was launched with the 2010 vintage and the first estate Pinot Noir arrived the following year. Production is about 500 cases including Pinot Noir, Pinot Gris and Riesling. I visited last year and was impressed by the wines. Visit www.wrigleywines.com. Thankfully, a decision was made to pick the grapes early, before the impending tropical typhoon that was headed to Oregon in September 2013. This year a ”feral yeast” program was begun. The vineyards and winery were inoculated with a yeast cultured from a strain of yeast from Burgundy. www.moutonnoirwines.com to join the mailing list or buy wines. Check out the cool schwag. This is a boutique winery specializing in vineyard-designated Pinot Noir. Owner and winemaker Jim Seufert produces about 2,000 cases annually at a small downtown winery that also serves as a tasting room. The wines are modestly priced considering the quality. Visit www.seufertwinery.com. 2011 was deemed “the miracle vintage,” because of low heat units and high rainfall. 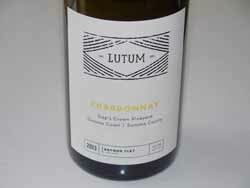 The resultant wines have delicate complexity and bright acidity. It seems unfair to review these 2011 vintage wines in an issue in which all the wines are from the more ideal 2012 and 2013 vintages. Founded in 2001, this was Oregon’s first LEED Gold certified, solar-powered, gravity-flow winery dedicated to Pinot Noir and Chardonnay production. A second winemaking facility is currently under construction to meet the demand for Stoller Family Estate wines. Bill Stoller bought his family’s 373-acre property in Dayton in 1993 and planted the first 10 acres each of Pinot Noir and Chardonnay two years later. Today, Stoller Family Estate is the largest contiguous vineyard in Oregon’s Dundee Hills AVA. Winemaker Melissa Burr has been on board since 2003, now producing about 20,000 cases annually. Visit www.stollerfamilyestate.com. Since winemaker Florent-Pierre “Flo” Merlier came on board as winemaker, the wines have reached the upper echelon in the Willamette Valley. Merlier is a native of Burgundy and a graduate of the University of Dijon. He met his spouse, Krista, an Oregonian, while interning at the same winery in Burgundy and relocated to Oregon in 2009. He has 82 acres of Pinot Noir and Pinot Gris at his disposable and the winery also now sources grapes for singular bottlings and the Alchemy blend. 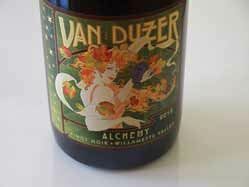 Visit www.vanduzer.com. 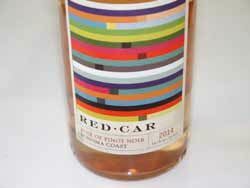 Owner and winemaker Jon Grant, crafts single-vineyard Pinot Noirs from various California appellations under the Couloir Wines label and value-priced varietal wines highlighting varietal character under the Straight Line Wine label. Couloir refers to a steep mountainside gorge, reflecting Grant’s love for ski mountaineering. While managing a wine store at Snowbird Ski Resort in Utah, he began overseeing the wine programs for the resort’s six fine-dining rooms. Before starting his own label, he worked at several Napa Valley wineries including Turley Wine Cellars, PlumpJack Winery, Corison Wines and Robert Mondavi Winery. The winery’s tasting room is located in historic downtown Tiburon. 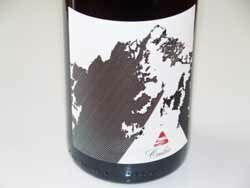 Check the website at www.couloirwines.com for hours. This winery specializes in vineyard-designated Pinot Noir, Chardonnay, Syrah and Sauvignon Blanc from the 1150 acres of the Dutton family’s estate vineyards in the Green Valley, Russian River Valley and Sonoma Coast appellations. Dutton Ranch, which now farms over eighty unique vineyards, was founded in 1964 by noted Sonoma County viticulturist Warren Dutton. The winery was established in 1995 by Joe and Tracy Dutton as Sebastopol Vineyards. 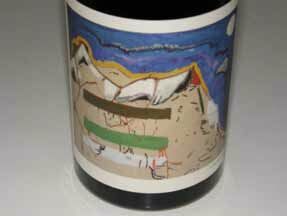 Sebastopol Vineyards became a label offering a broader representation of appellations. Visit www.duttonestate.com. 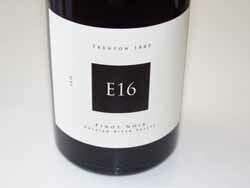 E16 takes its name from 3rd generation winegrower Robert Jones’ estate vineyard that is located off El Dorado County Highway E16 in the Sierra Foothills appellation of Fairplay. Today, Robert searches beyond El Dorado County lines to secure select blocks of Pinot Noir and Chardonnay for his E16 label. Veteran (30 vintages) winemaker Daniel Moore produces the wines in Sebastopol in a facility geared toward ultra premium Pinot Noir production. Winemaker Theresa Heredia joined Gary Farrell in early 2012 so the 2013 wines represent the first complete vintage under her watch. Gary Farrell and his successor Susan Reed, who preceded Theresa, maintained a very high standard for this winery, but based on my tasting of these early 2013 releases, I believe Theresa has taken the standard to an even higher level. I admired her winemaking skills at Freestone Vineyards where she worked previously, and these wines reinforced my high regard. Having top notch vineyards at her disposable is a big plus. The 2013 harvest was unusual in that Chardonnay ripeness advanced more quickly than Pinot Noir when the order is usually the opposite. 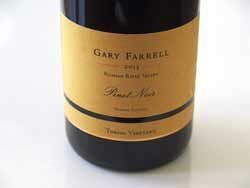 Gary Farrell is open weekdays for tasting. Visit www.garyfarrellwines.com. Daniel Morgan Lee has played a major role in Santa Lucia Highlands’ modern wine history. 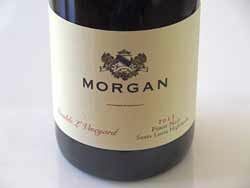 A University of California at Davis graduate, he and his wife, Donna, launched Morgan Winery in their spare time in 1982 while Lee was making wine at Durney. In 1984, they moved into their own winery in Salinas, and released their first Pinot Noir in 1988. The core of the wine program is the estate Double L Vineyard, a 48.5-acre mix of different clonal selections of Pinot Noir, Chardonnay, Syrah and Riesling. Neighbors include Sleepy Hollow Vineyard, Rosella’s Vineyard and Garys’ Vineyard. A variety of Pinot Noirs are offered including the entry-level Twelve Clones Santa Lucia Highlands appellation blend, and multiple single vineyard wines, all from Santa Lucia Highlands vineyards. The wines are consistently superb, and what one would expect from a veteran winemaker who has worked in the region for over 35 years. 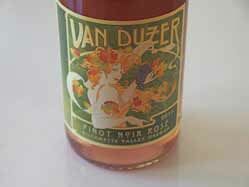 Dan told me that the 2013 vintage was slightly early, with focused, low yields, and very “clean” fruit. A tasting room is located in Carmel. The excellent wines are available online at www.morganwinery.com. 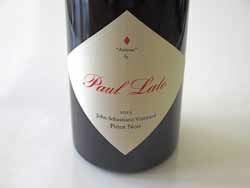 Paul Lato crafts small lots of vineyard-designated Pinot Noir, Chardonnay, Syrah, and Sauvignon Blanc from premium vineyards in the Central Coast of California. Working out of an unadorned winery in a large warehouse at Central Coast Wine Services in Santa Maria Valley, he started out modestly, shunning investors, and achieved considerable success on his own merits. Paul has a knack for finding the “sweet spot” in vineyards, seeking out the most treasured blocks and rows. He is a passionate winemaker who consistently offers wines of exceptional quality, and not surprisingly, has a large dedicated following that quickly snap up his wines each vintage. You won’t see his wines reviewed in major wine publications. The 2013 vintage is Paul’s twelfth release and the number of wines produced has increased. Some offerings were as small as two barrels. Increasing production is a challenge for Paul as he continues to uphold his high standards of authenticity. As he says, “It’s a challenge, but the kind I feel honored to have.” Paul said that 2013 was a year of “supreme balance,” with low yields bringing out a real focus to the fruit. He said, “I believe these 2013 wines are the best wines I’ve ever made.” 2013 Pinot Noirs I did not taste include “The Prospect” Sierra Madre Vineyard Pinot Noir, “Seabiscuit” Zotovich Vineyard Pinot Noir, “Belle de jour” Hilliard Bruce Vineyard Chardonnaym “Le Souvenir” Sierra Madre Vineyard Chardonnay, “East of Eden” Pisoni Vineyard Chardonnay, and “Kokoro” Santa Barbara County Chardonnay. There are now three 3-star Michelin restaurants in Tokyo serving Paul Lato wines to complement the three in the US, and restaurants in Germany and Switzerland are also now featuring the wines. Tasting is available by appointment. Visit www.paullatowines.com. Winemaker Thomas Rivers Brown is a Napa Valley superstar winemaker for several high-scoring Cabernet Sauvignon wines from multiple producers who indulges his love of Pinot Noir with single-vineyard bottlings of Sonoma Coast produced under his own Rivers-Marie label. The wines are highly treasured by a cadre of followers who snap up each vintage on the release day each year. Production is less than 1,500 cases so managing allocations is more challenging for Thomas than crafting his coveted wines. If you are not currently on the mailing list, your only source is the secondary market, as there is reportedly several thousand wine lovers on the waiting list. Visit www.riversmarie.com. The wines are bold and extracted in this vintage (except for the Summa Old Vines), and I would not be in a hurry to pop the corks except on the Sonoma Coast bottling. Jim and Jackie Reuling own a 14.4-acre Pinot Noir and Chardonnay vineyard (12.2-acres of Pinot Noir including Calera selection and two different “suitcase” selections from the Vosne-Romanée region of Burgundy) and 2.2 acres of Chardonnay from Montrachet Vineyard in Burgundy) in Forestville in the Sonoma Coast appellation. The vineyard was originally planted in 2003 in conjunction with Peter Michael Winery and used in Peter Michael La Caprice Pinot Noir in 2007 and 2008. 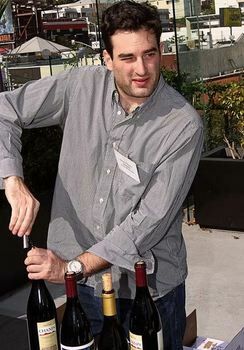 After this, Aubert bottled a critically acclaimed Pinot Noir and Chardonnay from the vineyard until 2011, when the owners hired Matt Taylor as the winemaker and vineyard manager to produce Reuling Vineyard Pinot Noir and Chardonnay. 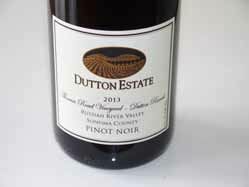 The 2011 Pinot Noir debuted in 2013 and the Chardonnay in the spring of 2014. Visit www.reulingvineyard.com. 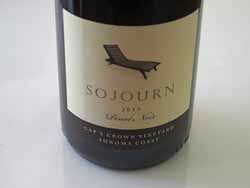 Based in the town of Sonoma, Sojourn Cellars is a highly acclaimed winery specializing in Pinot Noir, Chardonnay and Cabernet Sauvignon. Fruit is sourced from vineyards in both Sonoma and Napa counties, where vineyard operations are directed by the Sojourn team. The winemaker is Erich Bradley and associate winemaker is Randy Bennett. A Tasting Salon is located just off the Plaza in downtown Sonoma. Seated tastings are available daily by appointment. Visit www.sojourncellars.com. 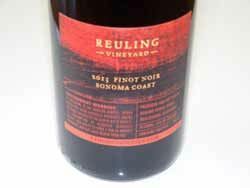 Later in 2015, Sojourn will be releasing a 2012 Reuling Vineyard Sonoma Coast Pinot Noir. The 2013 wines are rich in color and steeped in more flavor concentration than the 2012 vintage wines. 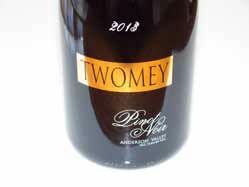 Twomey Cellars was started to produce varietals in California beyond Cabernet Sauvignon. The Duncan family used 40 years of winemaking experience to create Merlot, Pinot Noir and Sauvignon Blanc. The Pinot Noir and Sauvignon Blanc are produced at the company’s winery on Westside Road in Healdsburg where a tasting room is also located. Daniel Baron was Twomey’s founding winemaker and continues as Twomey Director of Winemaking to oversee production. Erin Miller was appointed the new Pinot Noir winemaker in 2014. She formerly had stints at Hartford Family Winery and Evening Land Vineyards. The Twomey tasting room in Healdsburg is architecturally impressive and a wonderfully relaxing spot to taste Pinot. Visit www.twomeycellars.com.